Grieving anew as a community in the wake of another horrific gun tragedy, Orlandoans bowed their heads Tuesday afternoon as bells tolled and names were called in remembrance of the 49 people murdered at the Pulse nightclub in Orlando two years earlier. Others, including survivors and families of victims of the Pulse massacre, joined a solemn crowd from the Orlando community at the First United Methodist Church of Orlando for a 10-minute ceremony in which family members and Robin Maynard-Harris of the onePulse Foundation read the names of those killed, and the church bell tolled their loss. Also on everyone’s mind was the horrific event a few miles to the south, where, on Monday night a deranged man with a history of domestic violence apparently shot and killed his two children and his girlfriend’s two children during a hostage siege. The scene began with Gary Wayne Lindsey Jr., 35, also shooting and critically wounding an Orlando police officer, and ended with him killing himself, according to Orlando police. The Pulse service already had enough tragedy to handle. “It’s such a beautiful thing to know that your loved ones will never be forgotten, not here in Orlando, not in Florida, not in the United States, not just in Puerto Rico, everywhere, all over the world,” said Maynard-Harris of the onePulse Foundation. 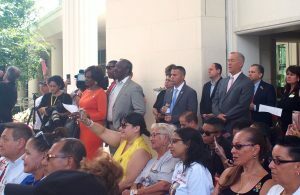 Among those attending were U.S. Rep. Val Demings and her husband Orange County Sheriff Jerry Demings, who is also running for Orange County mayor; Rob Panepinto, who is running against Jerry Demings; U.S. Rep. Darren Soto; and state Reps. Mike Miller and Carlos Guillermo Smith. Earlier a private, 10 a.m., remembrance ceremony was held in at the Pulse interim memorial, reserved just for survivors and families, plus appearances by Orlando Mayor Buddy Dyer and Orange County Mayor Teresa Jacobs. And at 7:30 a.m. Gov. Rick Scott made an unannounced visit to the Pulse interim memorial, according to his calendar.